Neolithic Flint Mines are the earliest industrial monuments in Britain. First dug into the chalk from around 4,000 BC, these shafts were cut in order to extract seams of flint. They represent a major achievement for prehistoric people using tools made of only bone and stone. 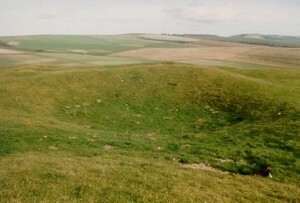 The first flint mines were on the South Downs of West Sussex and, although a number have been archaeologically examined, few of the results had previously been published. 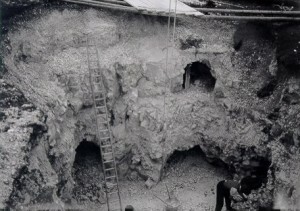 The Neolithic Flint Mines project was established in order to fully record and widely disseminate the results of the early 20th century investigations for the first time, placing them at the forefront of prehistoric research. Before the introduction of metal technology, the majority of tools, like knives, saws and arrowheads, were made from flint. Flint is a stone which in hardness and durability is second only to diamond. It possesses excellent flaking properties and can be chipped into a variety of shapes, sizes and implement types. It occurs naturally within the chalk and may be found just under the surface as nodules, or deep underground as horizontal seams. Mining for flint began in the Early Neolithic, around 4000 BC, many extraction pits surviving today as large, crater-like hollows. Over 70 sites have been identified as possible Neolithic flint mines in Britain, the densest group, comprising Blackpatch, Church Hill, Cissbury, Harrow Hill, Long Down, Nore Down, Stoke Down and Tolmere, being in West Sussex. 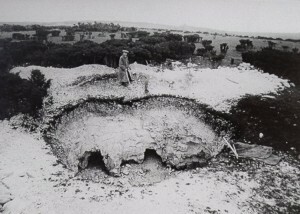 The characteristic surface hollows of partially backfilled flint mines were not fully understood by the first archaeologists, who believed they were a curious type of settlement or ‘holy place’. It wasn’t until the late 1860s that excavation indicated that these pits had been dug to extract flint. 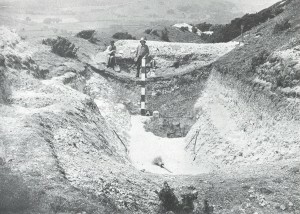 In the early 1920s, amateur archaeologist John Pull noticed a series of craters upon Blackpatch Hill, to the north of Worthing. Between 1922 and 1932, Pull supervised the complete excavation of a 9 mine shafts, 4 flint working areas, 11 round mounds and associated features at Blackpatch. 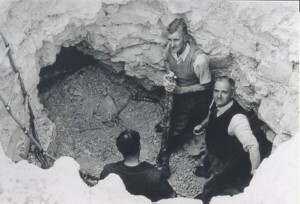 Inspired by his work, the Worthing Archaeological Society examined further mines on nearby Harrow Hill in 1924, directed by Elliot and Elliot Cecil Curwen, and in 1936, led by George Holleyman. After finishing at Blackpatch, Pull moved on to investigate the flint mines of Church Hill (1932-39 and 1945-49) and then Cissbury (1952-56). Sadly, although extensive records were made, John Pull died before a final set of reports could be published, leaving the flint mines in a form of archaeological ‘limbo’. Using the original excavation notebooks, plans, photographs and finds, all curated by Worthing Museum and Art Gallery, the nature of the of the Neolithic flint mines is slowly being revealed, whilst new survey and investigation is demonstrating the full extent and significance of the mining zone. Some of the more intriguing of discoveries made by the excavation team was a series of animal figures (mostly deer and cattle), carved into the shaft walls by the prehistoric miners. Together, these represent some of the earliest examples of art so far recorded from the British Isles. Substantial reports have now been published but the work is on-going and more discoveries no doubt await.